The doctors performing this procedure were used to lethargic, sick babies who were either asleep or too weak to fight. Immediately following the insertion of the cannula they had to perform a lumbar puncture. Once again, Penny screamed as they held her tightly while the doctor carefully inserted a needle into her spine and withdrew the spinal fluid they needed. Traumatic would not even come close to describing this procedure for both Penny and myself. Finally, after an ultrasound on her head and an MRI, she was hospitalised whilst doctors and specialists looked for answers to explain her condition. Eventually, when all tests drew blanks, she was transferred to a bigger hospital where she once again had to go through the trauma of having a cannula inserted and being poked and prodded by every doctor from differing departments who all seemed to want to see this baby with the mysterious condition. Throughout this period, I was unfamiliar with the philosophies of Magda Gerber and RIE (respectful parenting) and whilst I remained with Penny throughout the whole ordeal, I let everything happen to her without a single word. I did not think to warn her when things were about to happen to her and was often so emotional myself that I forgot to acknowledge how she must have felt to have had these things done to her. I know now that this would have amplified an already extremely traumatic time for her. Nothing in the way of tumours or brain abnormalities were found to be causing the paralysis and as Penny was displaying good vital signs, she was discharged and brought home after 4 days with a diagnosis of Bell’s Palsy. I immediately noted a change in Penny’s demeanour. She was tense, anxious even, and had a hard time being separated from me for any length of time. Over the next 6 months, Penny gradually began to relax and let some of her anxieties go, especially after I took her to a paediatric chiropractor. However, whenever I took her to the doctors for her immunisations, she would still get so worked up just being in a doctor’s presence and well before even having her needles. It was clear to me that she had held on to some of the trauma from her time in hospital. Had I known more about the respectful parenting philosophies inherent in RIE parenting I would not only have changed the way I approached Penny’s time in hospital but I would have also changed three things about taking both my girls for immunisations, which have always previously been a stressful experience in our family. I have my own hang ups about having needles as I would always faint when given vaccinations when I was younger. Because of this, I would always look away from the needles my children were given and grimace my face if I saw them being prepared. This would have only served to reinforce the girls’ fear of being injected. I would always let the needle be given to the girls without warning them it was about to happen. I hadn’t realised that with the appropriate verbal and visual cues, I could convey to them a rough idea of what it would feel like, giving them some time to both mentally and physically prepare for the needle. I was always guided by the nurses’ suggestion to distract the girls away from the needle so they could do it quickly and then I could comfort them afterwards. By using a toy or keys etc, they would be happily engaged in something else and then be totally shocked when the pain of the needle hit. I was never sure whether the screams that continued for a long time after was the result of the pain or the shock or the mistrust that this must have created of me. So, after her 6 month needles, Penny did not need any more immunisations until she turned one. Well, Penny turned one last week and this week she was booked in for her one year old needles. Some time between her 6 month and 12 month needles I read a post from another mother outlining how she enjoyed visits to the doctors with her children, even when needles were involved (I’m sorry but I can’t seem to find this post to link to it). 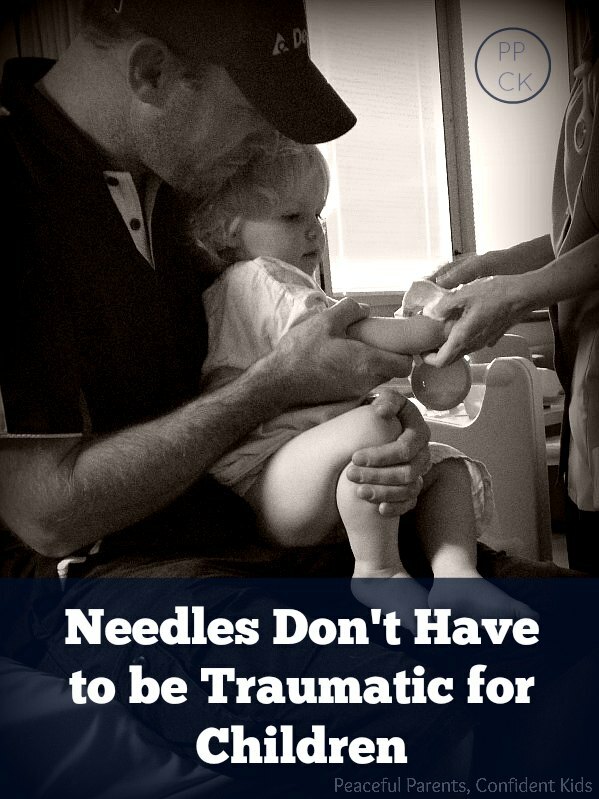 It seemed amazing to me and even a little sadistic that anyone could enjoy taking their children for needles. But I read with fascination and I vowed to rethink the way I approached immunisations with my girls. So when the day came to take Penny to get her needles this week, I began by letting her know what we were doing that day. I told her that I would be taking her to the doctors to get her needles. And I explained that she had to have them to protect her from getting very sick. I let her know that they would hurt a bit and it was ok if she needed to cry. I would be there to give her a cuddle. I repeated this mantra when we got in the car to go, and again as we were walking across the car park and also when we were sitting in the waiting room, waiting to see the doctor. I should let you know that I made sure I had organised someone to watch my elder daughter so I could give my full attention to Penny at this time. After she was weighed and measured by the nurses (which I was careful to talk her through as well), I held her on my lap whilst they prepared the three needles she was to have – one in her arm and one in each leg. I told her what was about to happen and at the same time I would take my finger and gently press it into the areas that would be injected. She looked on in fascination each time I poked her. The nurse came over with the first needle to go in her arm. I said “Penny, the needle is going to go in right here and will hurt a little. As I said this I used my nail on my finger to gently make a little scratch where the needle was about to go and reminded her it was ok to cry. The nurse gave her what I thought looked like the biggest needle I had seen in my life and both Penny and I watched as it went in. I am pleased to report that not only did I not faint – haha, but Penny did not even so much as whimper for the whole of the first needle. The nurse could not believe it! She watched it intently again and this time she did a small whingey cry for about 5 seconds after the needle came out. I acknowledged that it must have hurt her a little and let her know that she just had one more to go. The process was repeated for the last leg and again she gave a small cry for 5 seconds before turning around and giving me a little cuddle. She almost immediately wriggled off me to go and play with something she’d spotted, even pausing to give the nurse a cheeky smile. I honestly felt like crying! I was so proud of her and myself. We had turned an extremely traumatic event into a special time for connection and bonding. The nurse couldn’t stop exclaiming how she couldn’t believe that after three needles she wasn’t screaming the surgery down. I am positive that had I continued with using distraction, and not involving Penny in the process, she would have done exactly that!! That is such a great post, as all your posts! I’ve been reading for a while and find it very interesting and usefull. I have four-months daughter and am interesting i RIE, too. Hi Magda, thank you for your kind words. I am glad you find my posts useful. RIE was such a life changer for me that I wanted the whole world to know. I have no doubts that you 4 month old will benefit greatly from you using RIE as a guide. Good luck with it all. Thank you so much for this story, Kate. You’ve given me goosebumps and tears here at 6 AM! The experiences and insights you’ve been sharing on your blog are a tremendous gift to parents everywhere. Again, thank you, Kate! Thank you so much for this story! My son is just about to turn 12 months also and have his vaccinations. In the past they have often been quite difficult occasions. I am optimistic about trying your approach and believe it will help us all to get through the process together in a more positive manner. Thank you! We had the same experiences with Jack. Somewhere between injections I read something Janet had written about acknowledging the situation, explaining what is happening, being honest and present and it was just like you said; I told Jack he was going to have his needle, put my fingers onto his skin and the needle went in. He watched the needle, then looked at me, then nothing. The nurse was amazed. When Jack had his first MRI though it was a much different situation. A tiny little boy on a huge bed. With 2 drs and 4 nurses standing over him trying to hold him down. He was screaming. I wasn’t allowed in. I kept telling the doctor that I wanted to explain to him what was happening, that he was scared. Still they wouldn’t let me in. I sobbed and sobbed. I could hear him screaming in the corridor. For sometime after, just like Penny, Jack was traumatised by this experience and stayed very close to me. Since then, I’ve made sure that every doctor he sees, every treatment he has, I am there holding his hand, otherwise he doesn’t go in, I won’t let him. Some drs don’t like it, but I won’t let him go through that experience again alone. Oh my goodness, Kate, I can’t imagine what that must have been like for Jack and for you. We were very lucky for both Penny’s MRIs that I was allowed in with her. For her first one she was only 4 weeks old so I fed her to sleep and then she just slept through it with me sitting right beside her. Her second was at 8 months so she was given a general. 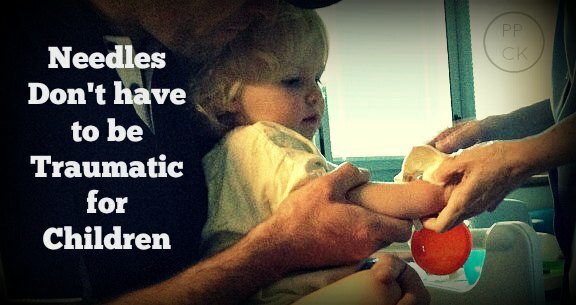 It was just like you described – tiny baby, big bed, drs, nurses and lots of equipment. I stayed with her until they put her to sleep and then had to leave. I wish I had known RIE though so I could have talked her through it. One of her biggest traumas came, though, when she woke from the general before they had removed the tubes from her throat and before they had called me in. I could hear her screaming but it didn’t sound right. By the time I got in she was a mess. It is so heartbreaking to watch your child go through that but at least now I know how to approach it to reduce the traumatic after effects that she might suffer. Kate, thanks for this post. I am an E.R. nurse and new mother. As I’ve been learning about RIE philosophies, I’ve been incorporating them into my nursing care of pediatric patients. You’re right that the mainstream advice is to distract kids from what is going to happen. I did the same script with my 6 month old son a few days ago when he went for his shots. He cried, but I held him and told him it was ok to cry. I’ve been using similar scripts with my pediatric patients. I’m just one nurse, but I wish things were different. The one thing I would say is: The nurses/doctors are dreading doing painful procedures to your child just as you are, and if you can put your child at ease and explain how you are thinking, most nurses will get on board and be more comfortable too. In my experience, it is usually the parents who set the tone for the attitude in the room during medical procedures. Good for you for overcoming your fear and being the leader for your child! Hi Sara, that’s wonderful that you are able to incorporate the RIE practices into your workplace. The children you nurse are so lucky to have you! It seems so logical to me now having immersed myself in it for some time that I am always wondering why it can’t become more mainstream. Thank you so much for this article! My daughter also has frequent needles in her life. I always correct the nurses when they say, “It won’t hurt.” Let’s be honest with our kids, then offer empathy. Thanks for sharing your story. It must be tough having needles frequently. We sure do need to be honest if we expect them to trust us into the future, don’t we. Let me know if I can be of any more help. My son, now 2 year old, usually cries like crazy every time we go to the doctor. He was fine, but once we had to run to the ER at 3 am because we couldn’t bring his 105 fever down. Once we arrived, since he refused to take the fever reducer, they took him from my arms and lay him down in the table ,while forcing opening his arms in a T to administer the medicine. It was so traumatic that after that, every visit to the doctor was impossible.Somehow, last time, I decided to prepare him and talk about it, explaining that we were going to the doctor, he will weight, meassure and give him a vaccine. etc, etc. I couldnt believe how well he did. It felt like a miracle, he was even laughing and smiling. So, I have to say, I wish I read your article before, but for the other mums out there I want to let them know, that talking and preparing does wonders. Thank you so much for sharing your story, Paula. I’m sorry you had to go through that traumatic event with your son but so glad you were able to find a way to make the doctor experience less stressful for you all.